Any pro's and con's for a Omega X33 ? Thread: Any pro's and con's for a Omega X33 ? 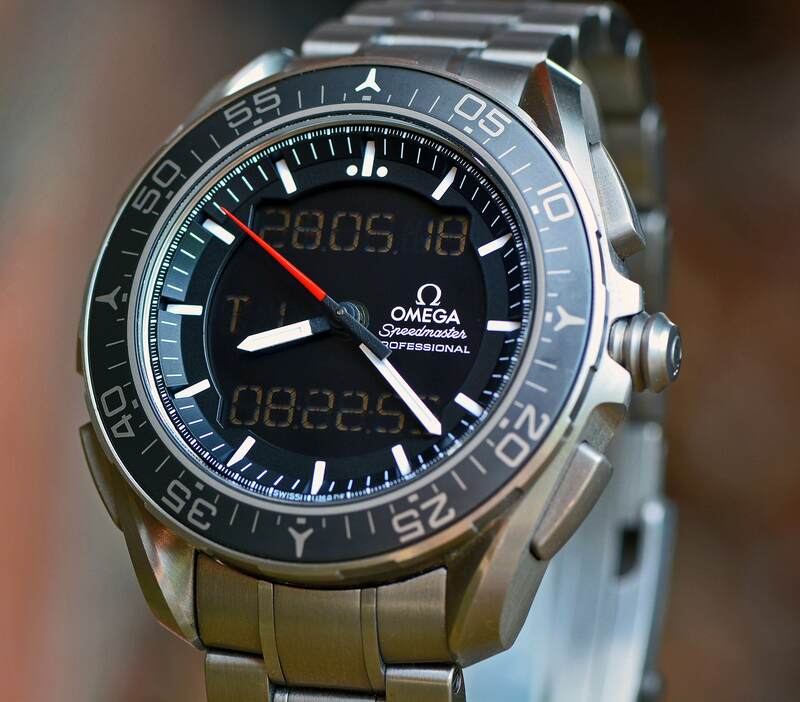 For some time now one of the watches i've had an urge for is the Omega X33, any thoughts on the model would be appreciated and would you go for a gen1 or gen2 and why ? I had gen1... Looked and felt like cheap G Shock. Module is stupid. 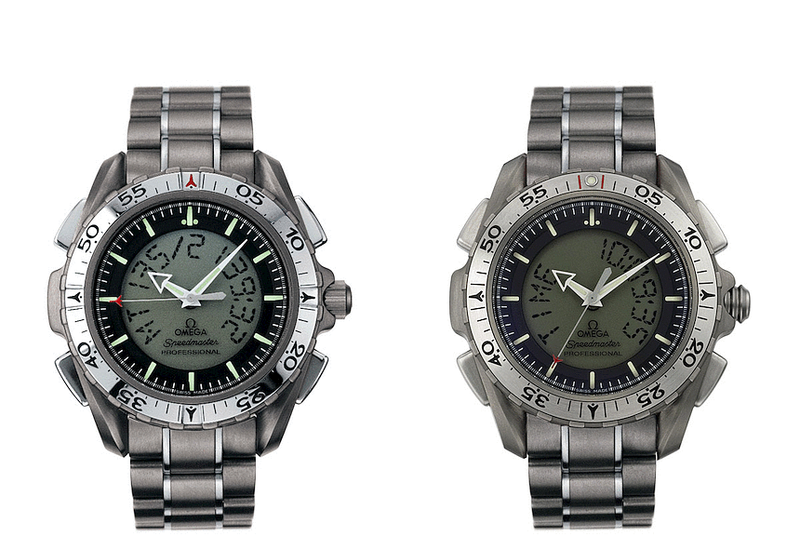 Breitling Aerospace works better with 1 crown/pusher than Omega with 4 pushers and crown. Not worth the money imho. I like the titanium; light weight and silver/grey finish. I prefer the round LCD panel to square-panel inserts of most (all?) 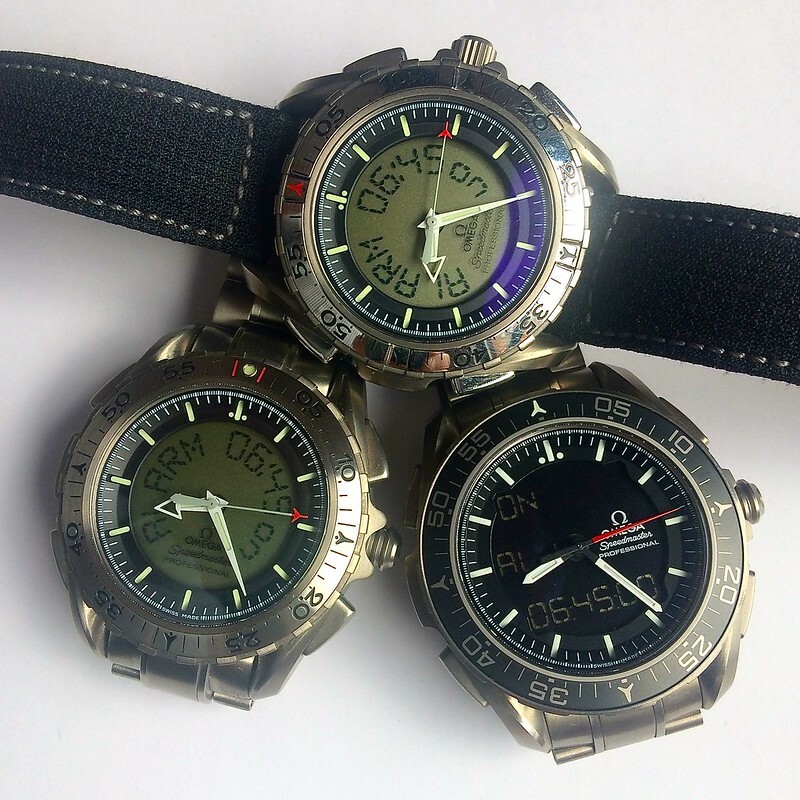 other Ana-digi watches. The controls are a bit confusing, when it comes to (say) changing timezones, but that's what the manual is for. Given the crown is push/pull, the Gen.2 crown makes more sense than the Gen.1 to me, so I would always go Gen.2 given the chance. Not a dress watch, very much a tool watch. Sadly the price has nearly doubled since I got mine. so it is hard to justify getting one now as a beater, but it is my go-to watch at the weekends or on holiday. Alarm volume is great, but who needs it in the world of smartphones? I will disagree with all of the above. The easiest to use and most legible ana-digital around. Four pusher usage is significantly simpler and more efficient than the Aerospace's one-crown-does-all feature, which sounds elegant on paper but is downright frustrating in actual use. Minimalist moody looks and lightweight, easy to keep wearing it and risk not wearing any of your others. It's basically a seamaster in titanium, with pushers; it's the pushers that seemingly change the profile so drastically. If you want a shinier alternative, look at the Breitling B1. Great watch. Only flaw is lack of water resistance. The Aerospace is far superior in all ways especially looks. If it’s not a problem for you, fine. But frankly it’s a strange question, and I almost stopped my reply after the first word. I like mine a lot but lack of water resistance means I have to consider program of the day before deciding to wear it. Not a problem I have with my other go to watches. I have a Gen3 so can't suggest which of 1 or 2 to go for. I love it as what is essentially my tool watch. I wear it every night (lume stays bright through to morning without having to use the backlight), time my coffee in the morning with it, use it as my holiday watch, set different alarms with it, set my vintage watches to it, barely notice it's there it's so light and enjoy it as a really functional (space) watch. And it looks miles better than the Breitbling. They're two completely different styles in my opinion. Both nice. I have both. I find the X-33 more usable; the Aerospace fits with a suit and tie better. I bought a Gen.1, liked it so much that I bought a Gen.2, liked that so much that I bought a Gen.3 Skywalker and then a Solar Impulse. I suppose I’m a bit biased but I absolutely love everything about them and the little differences between them. Either the Gen.2 or Gen.3 Skywalker would be the place to start, depending on the features you want and size that you are comfortable with. Bracelets are hard to come by so bear that in mind when purchasing. Ive had my gen 1 X-33 for a week and I think it's fabulous! It has a gen 2 crown, which I prefer, but I do think this is my favourite iteration. If you fancy one, you can't go wrong. I'm beginning to think, this could be my only watch, so my others are in danger ;) so conform able to wear, easy to set (after a couple of tries), light, and real wrist presence, lume that lasts the night. The circular LCD display really sets it apart in my view. Wanted one for ages. Got one. Was so much meh. I think the issue for me at the end Of the day is that it is basically an expensive g shock. Gen2 is I think a classic tool watch. There is a reason they are / wee so actively used up in the Space Station - fit for purpose. You know you don’t need to pull the crown to set the features? They all are activated by pushing the crown IN for a couple seconds. They are designed for use wearing gloves you know! The Gen3 I have and nearly bought a Gen2 again. The Gen3 is different again - with almost an impossible array of features. Very logical when you get used to them. What sets it apart from any other watch is the exeptionally loud alarm - designed to be heard above the noise of a cockpit or other engine noises. Casio’s are pathetically quiet and useless comparatively. The latest Gen3 (and Gen2) can take the vibration of lift off and G forces dealt out in space flight so should be good for us earthlings. Sure the water resistance label says 30m - aparenty due to the echo chamber rather than the watch case itself - others can attest they swim, sauna, usual water activities and one version was for th America’s Cup sailing team. Just saying. Last edited by MartynJC (UK); 9th November 2018 at 08:20. Thanks all great food for thought and appreciated, I do like the bezel more on the 3 Skywalker, what would be the "right" price for a used example with papers etc ? Isn’t it okay for swimming? Surely suitable for most people day-to-day. Not wishing to open this particular can of worms again, but pretty sure Ralphy posted a while back that he's dived with his. To the OP: I'm on my second Gen2 and I much prefer it to the shiny bezel of the Gen1. The Gen2's are more sought after for not a lot more money, but also harder to find. The bezels for the gen1 /2 are interchangeable, I may try a gen2 bezel sometime. +1, I owned an X33 and much preferred the Aerospace. I didn’t know this. The extra bit with holes (that acts as amplifier for the alarm) scared me, and Brendan unfortunately doesn’t do this model so I didn’t get it tested. The holes don’t pass through the case back, it is just a resonance area to make the alarm louder. The watch is rated to 50m so if the seals are healthy is fine to swim with. I had had one and got rid. The main issues with them are battery life which is poor (as little as 3 years in some cases) and the expense of servicing which is fiddly. The likes of Timpsons aren’t the people to change batteries on these as there is potential to bugger up the alarm and damage or lose the tiny titanium screws. Nice to experience, not so nice to keep running. If I were doing it again, I would go for a gen 2 or better still gen 3. The gen 1 crown is a pain. Last edited by Padders; 9th November 2018 at 10:47. I also had a Gen 3 which i bought for £2500 ish and found my G Shock or Pro Trek would do the same job plus be more accurate for less than £500 so it was an easy decision to sell mine. I would classify myself as primarily a vintage enthusiast but my X33 is definitely a watch I would struggle to do without. Having had mobile phone alarms fail me in the past (blue screen of death and accelerated overnight battery exhaustion, for example) the alarm is the killer function. It’s basically my travel watch which means that it gets worn quite a lot. I wouldn’t take it near water but that rule generally applies to me as well. Incidentally, there is an in house Omega cheaper alternative to the X33, the SM120m multifunction. Many of the things that annoy about the X33 also apply here but it does have the virtue of being available for about a third of the price. Uses the very similar 1665 movement and is an excellent travel watch. I don't particlularly miss my X33 but use this a lot. Last edited by Padders; 9th November 2018 at 11:01. I currently have a Skywalker (Gen 3) and have previously had a Gen 1 which I retrofitted with a Gen 2 crown. I bought the Skywalker with the first bonus I received in my current job, and it is absolutely a keeper. I’m biased, clearly - but I think they are great; the control schema is incredibly logical and well designed once you get your head round it. Clearly it isn’t as simple as the Aerospace’s crown-only option, but I’ve always found that required a “knack” to operate, and having four pushers and a crown makes for a far more flexible system, IMO. I particularly like the Skywalker’s “programmable” pusher, which you can use as a shortcut to access any particular function (can’t recall whether the Gen 1 had the same feature). 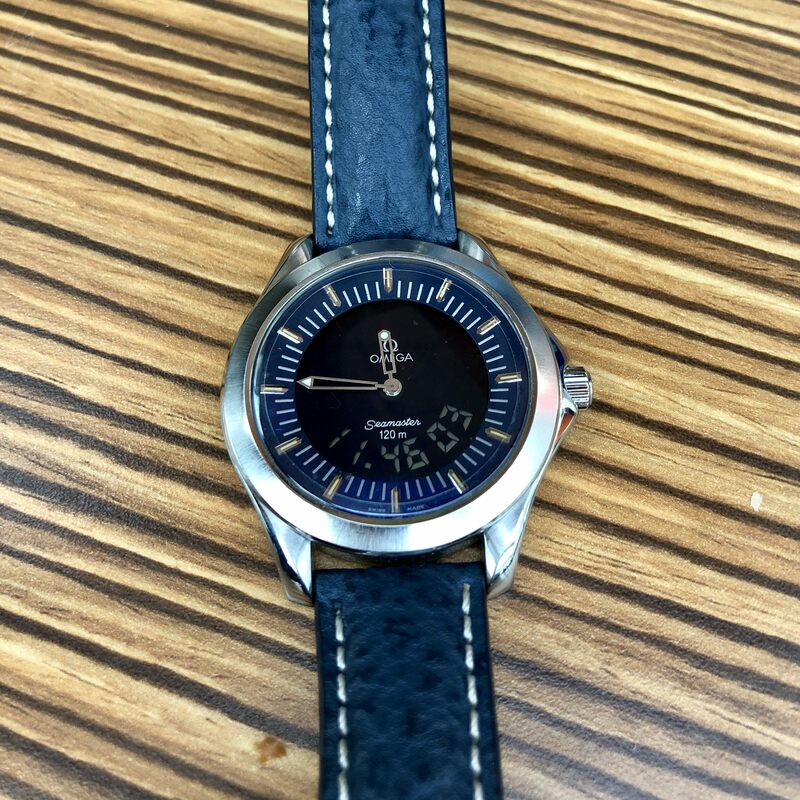 I use mine for work, travel, holidays, general purpose tool watch wear - I’ve swum, sauna-ed and dived (albeit only 10m) with mine and had no issues with water ingress. Being a space nerd I find the ESA/NASA links with this series rather cool, too. Oh, and it’s accurate - per watchtracker, my Skywalker has run at +7 seconds a year for over two years. Incidentally, there is an in house Omega cheaper alternative to the X33, the SM120m multifunction. Many of the things that annoy about the X33 also apply here but it does have the virtue of being available for about a third of the price. As a matter of interest, how loud is the alarm? Nowhere near as loud as the X-33 but is enough to wake you or alert you as long as you aren't at a thrash metal gig. At 38mm it is rather more subtle too. 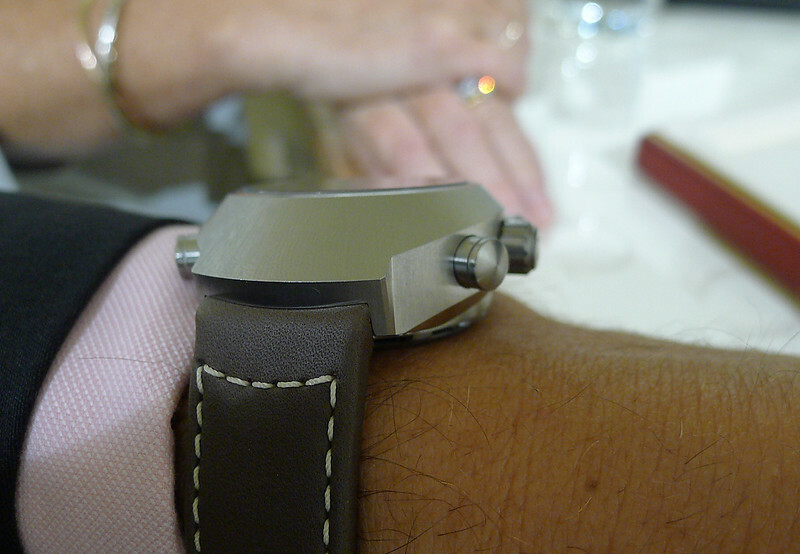 I found the X-33 to be rather clunky on the wrist. Last edited by Padders; 9th November 2018 at 12:52. The mix of analogue and digital in the x-33 is OK. But it's so much better executed in the z-33. I love my z-33. It's a bit 1969, 1975 and 2525. The X-33 is quite chunky, but in the current climate that doesn't stop it being worn with a suit. Chris Hadfield manages to pull it off and he's quite small! Plus with it being titanium the bulk isn't reflected in the weight so I've had no comfort problems with it. I think the Gen 2 is nicer, although I am a Gen 1 owner. Here are the 2 side by side so make your own mind up. I also favour the X-33 over the Aerospace (apart from the Cobra Yellow Night Mission maybe!) and I have both. I rarely wear the Aerospace now and wear the X-33 if I need those functions. I do still have a bit of a soft spot for my Aerospace as it was the first expensive watch I really desired as a much younger man. Chris Mann’s latest podcast discusses the X33 in reasonable depth. It is one of his favourite watches it seems. The X-33 bit is about 20mins in. Last edited by Padders; 9th November 2018 at 19:55. Thanks for the information I will keep a look out for a Skywalker (I like the bezel) as first choice and if no luck then a gen 2. Thanks, ser 3 is the one I like but I think I prefer the hands of the first two models. Brightlings are only for a) airline pilots or b) people that want to be airline pilots. Mine’s back from Alsal with a new battery. Great service from Ali, who even took the time to set it correctly. Which is not the easiest thing to do on a X33. Loved my Series 3, but I sold it to Foxy100 when I got my Aerospace Evo. Last edited by andy tims; 16th November 2018 at 14:37. Just noticed they're all set for the same alarm time, must make quite a din with 3 going off at once  ! You fool! Incidentally the boy loves it and the way it lights up at night when you press the pusher. I wear it all the time, thanks for letting me have it!